It rained all night and the lines creaked because of the high current. 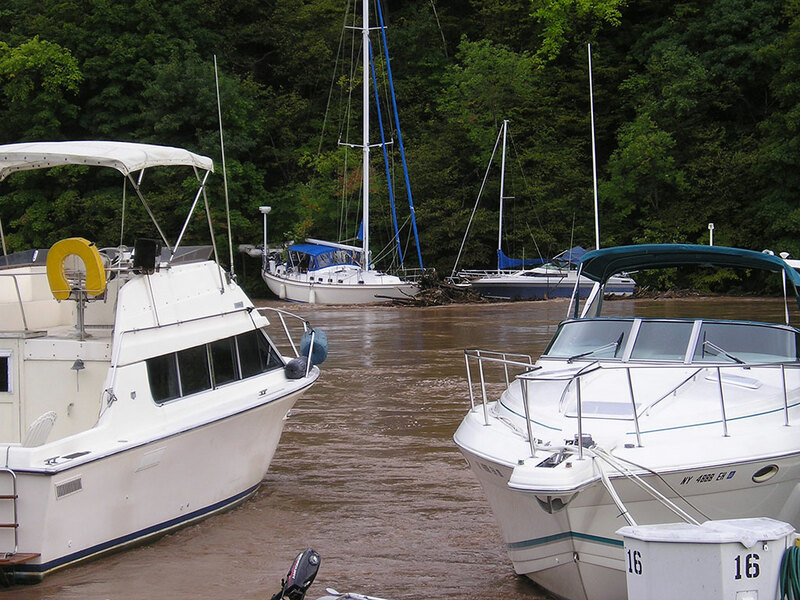 NOAA put Catskill Creek under a flood watch. The current is running 7-8 kts so there is only one way to go which is out toward the Hudson. A large sailboat just passed out of control. It wrapped a rope around the prop and the captain is trying to drop his anchor. It spun around in the current and drifted over to the south shore and hit a sailboat that was anchored there. His anchor finally held. Next trash started piling up dragging the front of the boat down and the captain was on the radio with the Coast Guard who were of little help. After a little while a powerboat broke loose with a great crack sound and drifted down attached to its dock and was trapped against the 2 sailboats. The sheriff took the crew of the large sailboat but was otherwise helpless to free the boats. The tide was coming in and added to the flood. 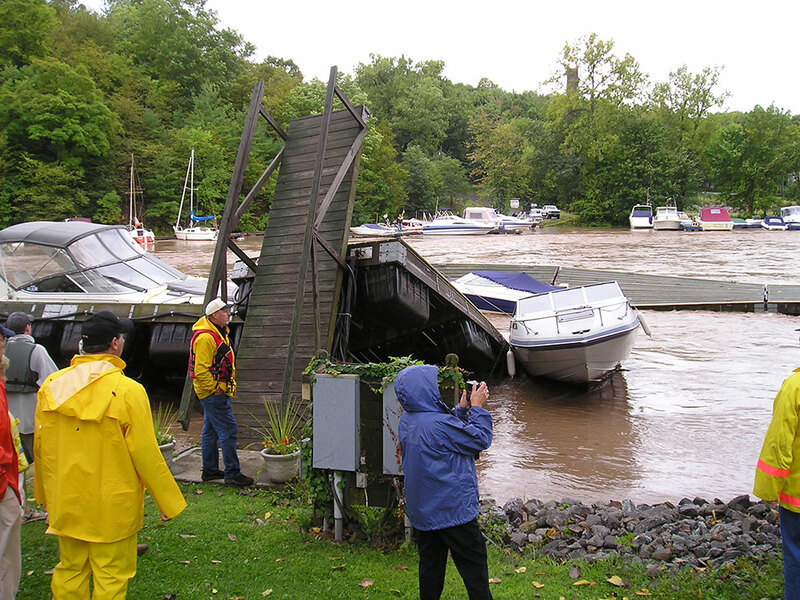 Another dock broke loose from the far shore and carried 4 boats out to the Hudson River attached to their docks. On our side a couple of docks simply flipped over trapping boats in various positions. The rain stopped around 2:00 PM and the water upstream began to drop. Everyone said that our dock was probably the safest and tonight when water started to drop and the current was reduced we were still afloat with no damage. We used our anchor rode to tie our boat, the Albin and the finger dock to a huge tree. By 8:00PM it was dark and cold and Mavis decided that a hotel would be best for the night. There was a B&B just around the corner from the marina so we are camped in a large suite.